Am I supposed to stop posting cookie recipes after Christmas? Unfortunately I’m terribly disorganized, and many pre-holiday photos are still lingering sadly in the tunneling clutter of my file system. But today the last cookie recipe sees the light of day! Although I suspect there will be more to come. I mean, what occasion are cookies not appropriate for? 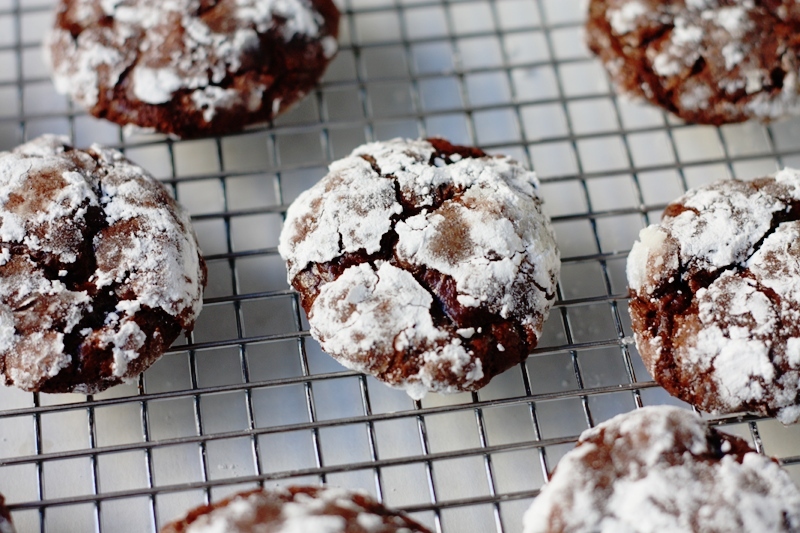 These cookies are another recipe that’s naturally gluten-free, and impossibly easy. Plus no butter, which would normally be sacrilege but in meringue recipes is actually acceptable (especially when there’s a large quantity of chocolate). Egg whites are beaten with sugar into a thick cream, and then you add cocoa powder and chocolate for intense chocolate flavour. A roll in powdered sugar makes the cookies all pretty and snowy-looking, which I’m a sucker for, and it turns out many others are too! 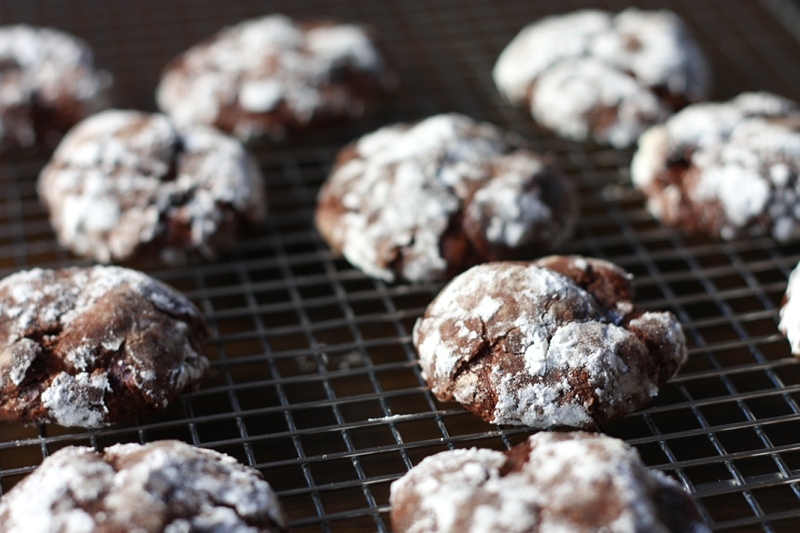 I sort of expected a recipe based on meringue to turn out airy and light, but these cookies are seriously rich, dense, and fudgy. If you’re anything like me, you will love them. The only thing I minded was they were a tiny bit too sweet for my tastes. I thought about skipping the sugar roll at the end, but it makes them so pretty that I don’t think I can leave it out. Instead I might try reducing the sugar in the dry ingredient mix by half a cup or so. Preheat oven to 400°F. Butter 2 large baking sheets or line with parchment. Gently melt 1 cup chocolate chips in glass bowl in microwave, stirring twice, about 2 minutes. Cool slightly. Place 1/2 cup sugar in bowl. Roll 1 rounded tablespoon dough into ball; roll in sugar, coating thickly. Place on prepared sheet. Repeat with remaining dough, spacing 2 inches apart. Bake until puffed and tops crack, about 10 minutes. Cool on sheets on rack 10 minutes. Transfer to rack; let cool. I’m new here. But beautiful pictures, I will say. It’s never too late for cookies! My mom used to make some that looked like this – and now I have a craving for them. I think I know what I’m doing tonight!!! these cookies were great & they survived freezing nicely. 🙂 thanks for adding the gluten-free tag. thanks all! glad you enjoyed them. These look like chocolate decadence! Love your blog! Delicious cookies! I just made them today and they are indeed dense and fudgy! (: Thanks for the recipe. Okay, i just tried to make these and they turned out flat and completely crunchy. Any advice?!?! oh no! that’s weird, I haven’t had that problem… Some thoughts – did the egg whites whip up properly? They provide most of the structure in this cookie. The other common remedy to flattening is to refrigerate the dough first. If you try making them again, I would pick a dry day with not much humidity, since that can make rising more difficult. Also, check your chocolate, and make sure it was good-quality and not just chocolate-flavoured, which wouldn’t have the same chemical properties. The crunchy problem is probably due to overbaking, check your oven temperature and also just keep an eye on them – if they were flat they’d probably bake faster. It’s hard to tell without knowing what you did, but I hope this helps! You are currently reading belated cookies at one cake two cake.